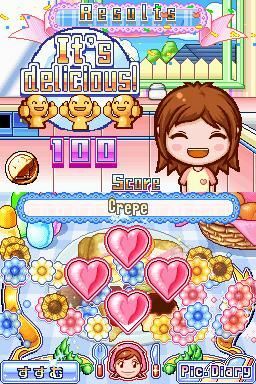 The original Cooking Mama game was well-liked - yet another example of games making fun out of an activity we abhor in real life. But players eventually stopped caring what virtual dish might result from a furious session of whisking, chopping and frying. Everything blurred together. Now an enhanced sequel is here, but not much has changed. Cooking Mama 2 features new modes and recipes, but mostly it's the same quirky, hunger-inducing, initially-captivating-but-ultimately-repetitive experience as its predecessor. The graphics and sound are still vibrant and uniquely charming (especially the jaunty background music and the barely intelligible voice actress), only now they're more detailed and can improve your performance. Ingredients now evolve more dynamically as you cook, giving you more natural cues as to when to execute the next step. For example, you'll drop a pastry into a boiling kettle of liquid and retrieve it only after it floats back to the surface and changes color, or you'll place meat on a grill and flip it once it browns and starts smoking and hissing. For comparison, the first Cooking Mama would have just used a scrolling timeline to tell you when to flip it, and the browning would have been just a graphical touch, not necessarily a signal. Description Promises new recipes, twice the minigames, and a brand-new multiplayer cook-off mode.